Australia beat England 12-6 in the Rugby World Cup final at Twickenham. Will Carling led England out on home soil against Nick Farr-Jones' Wallabies, who had defeated the reigning champions, New Zealand, in the semi-final at Lansdowne Road. David Campese had starred with his 'miracle pass' to set up Tim Horan that day, but their try in the final came from a more robust source. Prop Tony Daly was the beneficiary and the victory was sealed by the conversion and two penalties from the boot of fly-half Michael Lynagh. 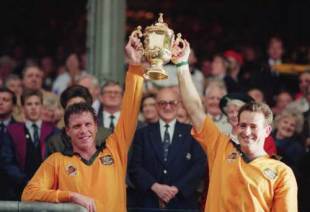 In the Australian second-row was John Eales, who would lift the trophy as skipper eight years later in Cardiff. Josh Lewsey equalled the England record for most tries in an international scoring five, in their 111-13 demolition of Uruguay in a World Cup pool match in Brisbane. Lewsey cut loose in front of over 46,000 at Lang Park in what remains the only Test meeting between the countries. Iain Balshaw, Mike Catt, Jason Robinson and Andy Gomarsall all bagged braces, with Stuart Abbott, Will Greenwood, Dan Luger and Lewis Moody completing England's fourth biggest Test win. Health & Safety 1960s-style. After the mid-week match between Oxford University and the Oxford University Greyhounds XV, the 30 students were lined up for anti-tetanus injections. It was reported that the directors of Bournemouth FC would no longer permit Hampshire to play their county rugby matches on their ground at Dean Court. The ground had been badly cut up in rugby matches leaving club officials concerned for the safety of their footballers. The first official post-war Welsh trial saw the 'Probables' beat the 'Possibles' 9-0 at Pontypridd. Neath's Viv Evans, star fullback of the 'Possibles', had to wait nearly eight years before winning his first Welsh cap. Wales fullback Viv Jenkins put in a polished performance for the London Counties at Twickenham on his 24th birthday playing against the All Blacks, who won 11-0.